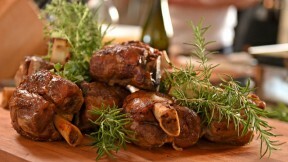 This Braised Pork Shanks with Fennel recipe is also known as "Stinchi di Maiale Brasati con Finocchio". It appears in Lidia Bastianich's special, Lidia Celebrates America. Preheat the oven to 400 degrees. Season the pork shanks with 1 teaspoon of the salt. Spread some flour on a rimmed sheet pan, and dredge the shanks in flour, tapping off the excess. Heat a large skillet over medium-high heat. Add 2 tablespoons of the olive oil. When the oil is hot, sear the shanks, in batches, on all sides until well browned, about 8 minutes per batch. Set the reserved fennel tops and dark green parts of the leeks in the bottom of a large roasting pan. Set the shanks on top. Add the chicken stock, 1 cup water, and the bay leaves. Cover with foil, and roast until the shanks are just tender and beginning to pull away from the bone, about 2 hours, basting periodically.